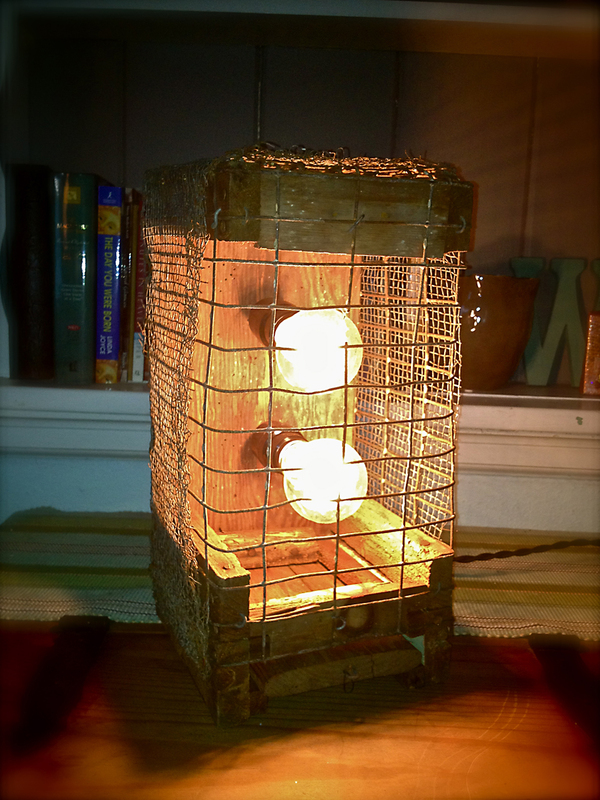 This one of a kind table lamp is made from an old primitive barn find rabbit trap. 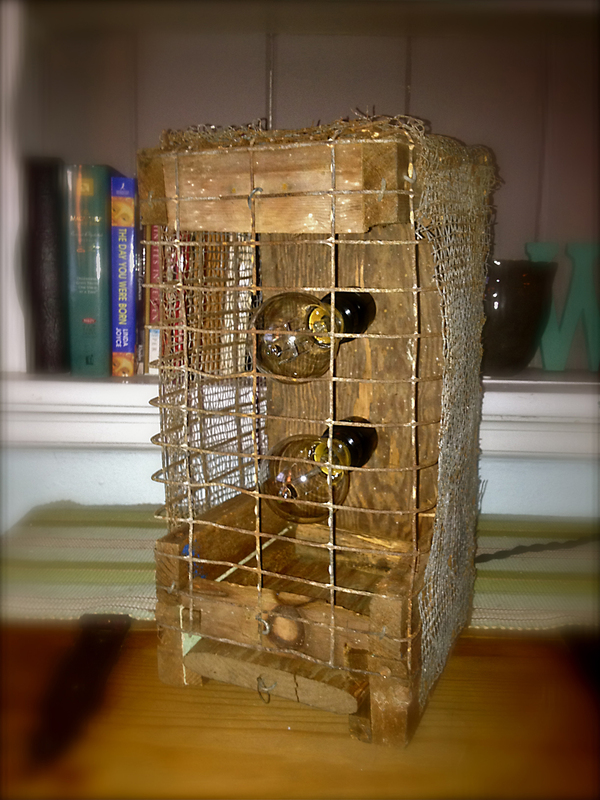 Frame is made of wood, crudely fashioned, but well built, with various styles of chicken wire. 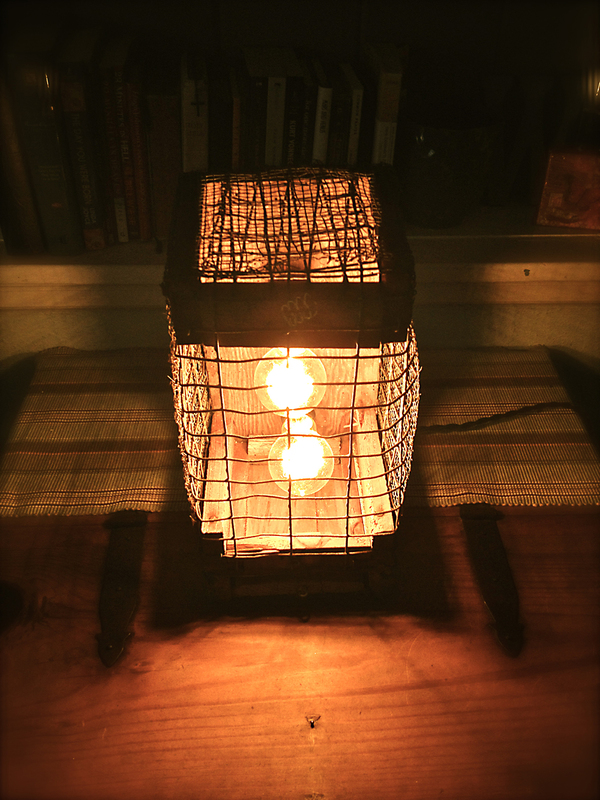 Lamp has a nice rustic look and is very cool. The trap stands on it’s end, bottom “door” slides out to gain access to the inside to change bulbs. 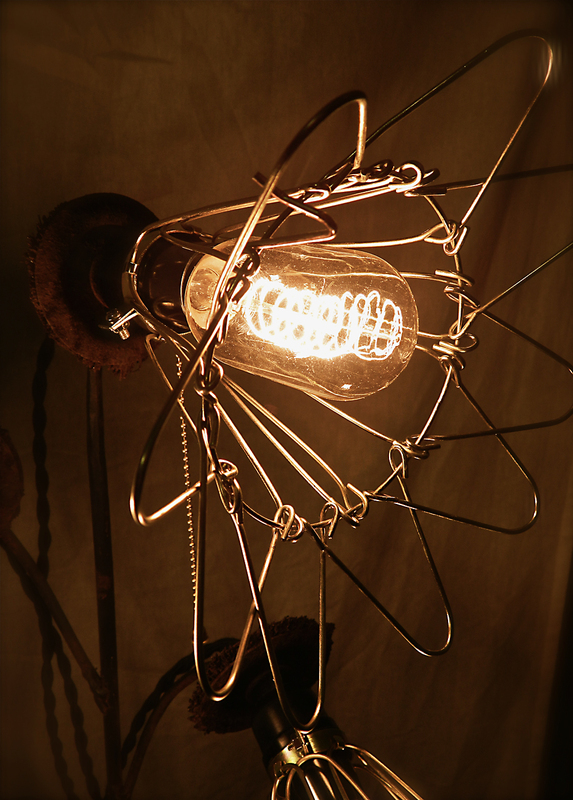 The lamp was wired up with two bakelite style sockets, wired with vintage style cloth covered twisted wire, and comes with two vintage “Edison” style coil filament light bulbs. Cord is approximately 8′ long and plugs into a standard wall outlet, with vintage style plug. I knew when I found this thing, it was a great candidate to be cleaned up and repurposed. Very cool piece and makes a great addition to your farmhouse, cottage, living room or office. Unique, one of a kind wrought iron floor lamp. 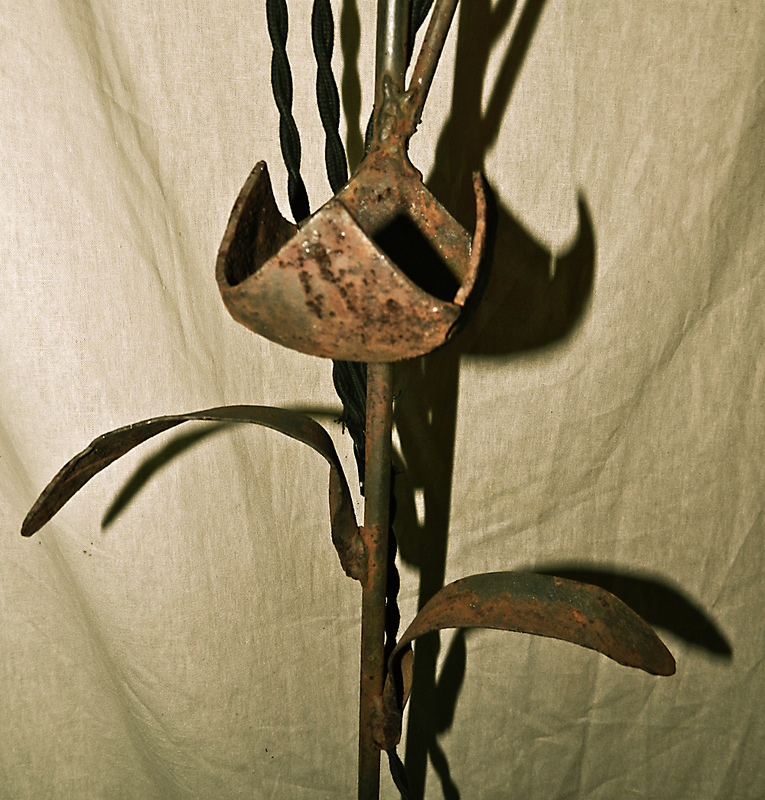 Made from a vintage patina’d wrought iron yard decoration. Piece was handmade to look like flowers. 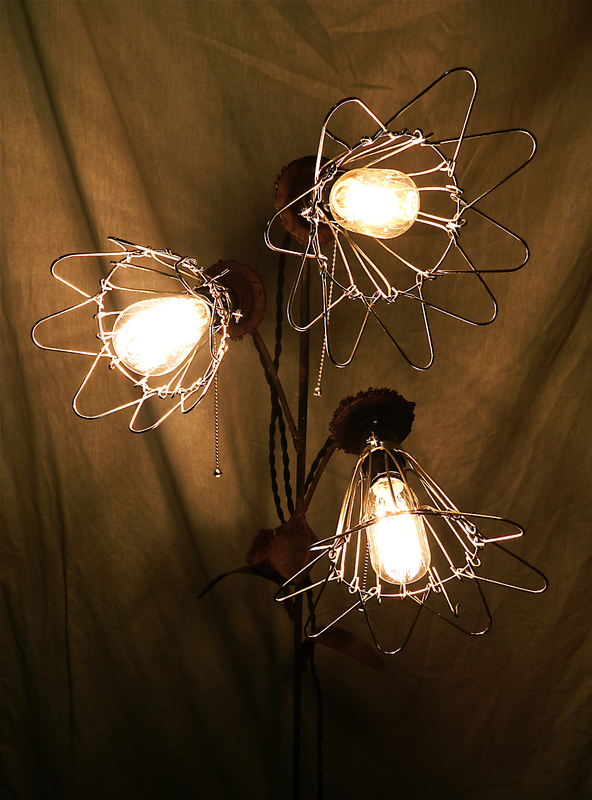 The stems are all wrought iron with petals and looks like the flowers were made from old wire wheels. Stem has a rusty colored finish with nice patina. We picked this up as a piece of garden or yard art a few years back at a yard sale, and recently decided that it would make a really cool floor lamp. We picked up a very heavy brass base awhile back, welded the stem to a threaded coupling and used that to serve as the base. 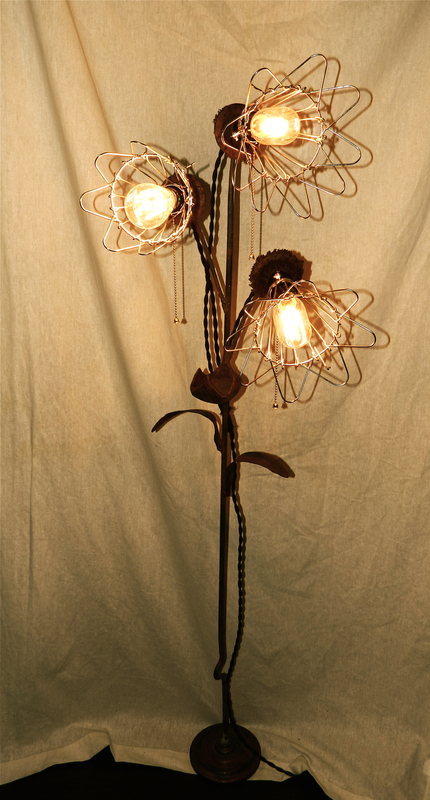 We used vintage reproduction brass colored industrial cage lights which flip open or closed and thought they were the perfect addition to continue the original maker’s flower theme, but add a nice industrial look. 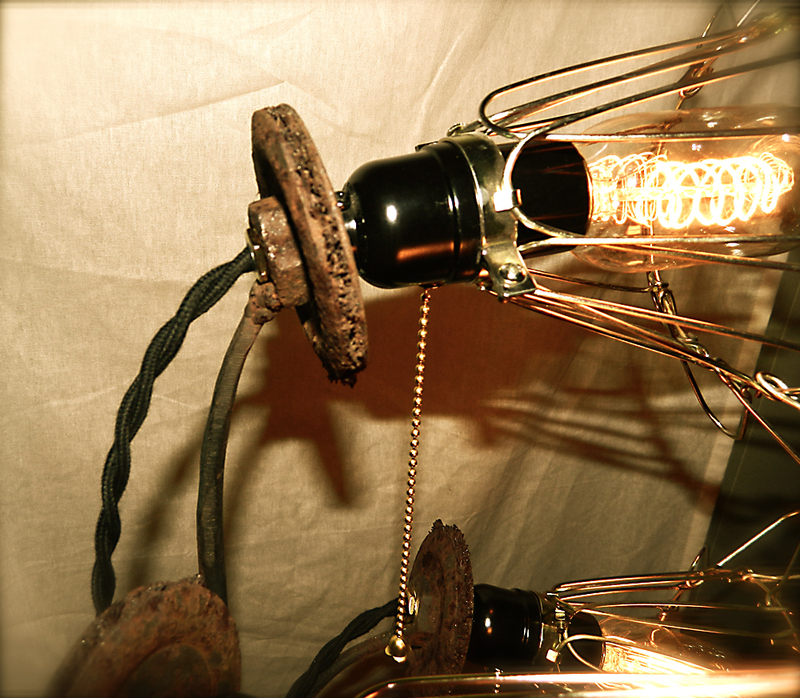 Sockets are black bakelite, with brass pull chains, so each bulb can be illuminated individually. All vintage black twisted cloth covered wire was used as well as a vintage reproduction plug. 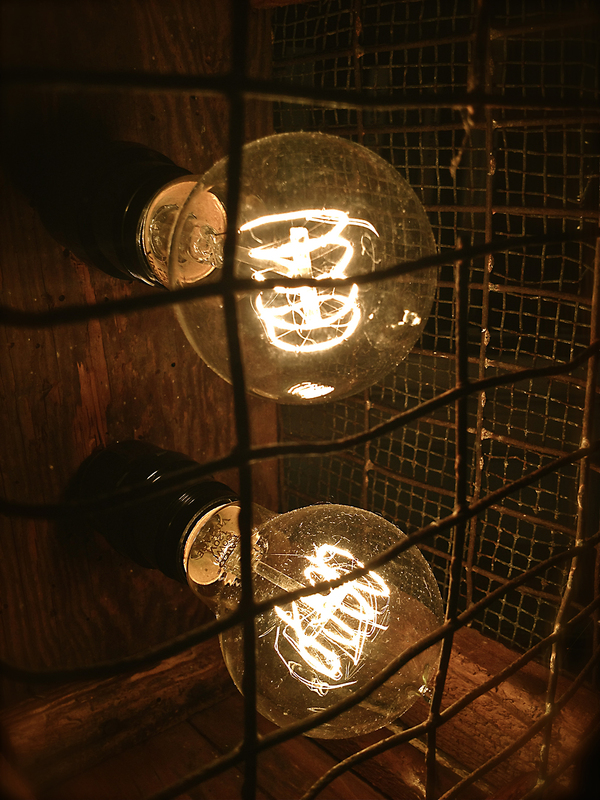 Three different styles of 40 watt vintage bulbs are used and included. Lamp stands 52″ tall. For sale in our Etsy shop. Upcycled wrought iron garden floor lamp.